^ Annex II: Relative importance of millet species, 1992-94. The World Sorghum and Millet Economies: Facts, Trends and Outlook. Food and Agriculture Organization of the United Nations. 1996. ISBN 92-5-103861-9. ^ Tarannum Manjul. Millets older than wheat, rice: Archaeologists. Lucknow Newsline. January 21, 2006 [2008-04-14]. （原始内容存档于2008年5月9日）. ^ Oldest noodles unearthed in China. BBC News. 12 October 2005. ^ 青海喇家遗址出土4000年前的面条. 新华社. 2005年11月9日. （原始内容存档于2016年3月4日）. Crawford, Gary W. Paleoethnobotany of the Kameda Peninsula. Ann Arbor: Museum of Anthropology, University of Michigan. 1983. ISBN 0932206956. Crawford, Gary W. Prehistoric Plant Domestication in East Asia. (编) Cowan C.W., Watson P.J. The Origins of Agriculture: An International Perspective. Washington: Smithsonian Institution Press. 1992: 117–132. ISBN 0874749905. Crawford, Gary W. and Gyoung-Ah Lee. Agricultural Origins in the Korean Peninsula. Antiquity. 2003, 77 (295): 87–95. 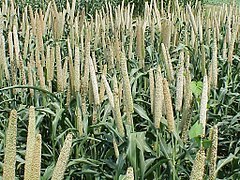 AboutMillet.com - Complete resource for millet health benefits, recipes and cooking tips. （原始内容存档于2014-05-17）.